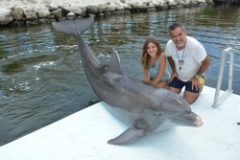 Swim with Dolphins - The Ultimate Vacation Thrill! Get to know a dolphin while you do a variety of fun behaviors together including the exciting dorsal pull! Experience Dolphins and Sea Lions Up Close in an All Natural Setting! Instead of a scripted "show", we offer narrated behavior sessions with the different social groups of dolphins on a variety of topics. From fun facts to playtime, research to husbandry training, there's always something fun and interesting to see! Experience and learn about these amazing animals in narrated behavior sessions and educational presentations. Make a new dolphin friend in Meet the Dolphin. Free Digital image included! When Jayne and Mandy Rodriguez founded DRC, they made a commitment to the dolphins that they would always be cared for. Whether a dolphin or sea lion is born here, or comes from a rescue or other situation, we provide a healthy, happy, home for life. Adult DolphinLab Alumni - Come Back and Experience More! 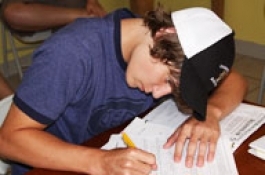 If you've already taken the Adult Basic DolphinLab, come back for an advanced class this summer! Available for ages 18 and older. 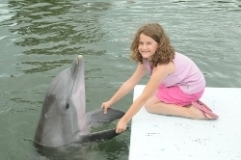 A few spaces remain for the 2019 summer Dolphin Camps. 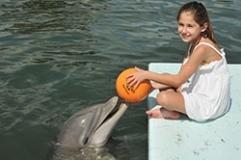 Your children will have a great time playing with, and learning from DRC's dolphins, sea lions and staff! Dolphin Research Center offers many ways, including swimming with dolphins, where you can interact with dolphins and sea lions. Use the slider below to see the programs and click on the photo to learn more or make a reservation. Admission Price: Adults: $28:00, Military/Veterans (present military ID): $25:00, Children 4-12: $23.00. Children 3 and under free admission. All guests under the age of 18 must be accompanied by a paying adult. Please note: General Admission does not include hands-on contact with any marine mammals. Interactive programs can be purchased separately. Get our most competitive General Admission rates by purchasing your tickets on-line! Purchase a General Admission and spend some time observing the dolphins and sea lions in training sessions or interacting with each other during their private time. Watch your friends and family participate in public programs from one of our general access areas. Price: $199 - includes all-day admission. (Price does not include On-line Reservation Fee). Duration: Please plan to be at DRC for up to 2.5 hours from your check-in time. Your actual program will take place within that time span. Enjoy watching the dolphins, a theater presentation, our Sprayground, or a snack at the food cart until your program begins. Your in-water experience will last 20-25 minutes. Our most popular dolphin program! Includes a dorsal pull. Ages: Great for all ages! Open to individuals, couples, and families. A paying, participating adult (18+ Yrs) can hold one child 3 years old and under on hip during program for no additional cost. A paying participating adult (18+ Yrs) must accompany children 4-7 years old. Duration: Approximately 20-25 mins in-water on a submerged platform. The ideal program for families with young children! THE ULTIMATE TRAINER EXPERIENCE. Accompany trainers all day during this intensive interactive adventure! 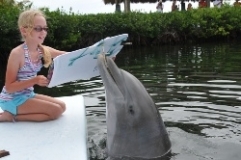 Price: Early Bird Paint with a Dolphin Special - $80. Special price includes admission. (Price does not include On-line Reservation Fee). Not able to reserve the day you want online? Please call 305-289-0002 (9 a.m. to 4 p.m. eastern time) and see if our staff can help you! Ages: 3 Yrs and Up. Children ages 3-7 years must be assisted in the program by an adult (Age 18+) for a small charge of $10. Work with our gray artists and create a one-of-a-kind masterpiece! Price: $30 per program participant. Does not include all-day admission. Free digital image included. Ages: 1 Yr and Up. A paying participating adult (18+ Yrs) must accompany children 1-7 Yrs. 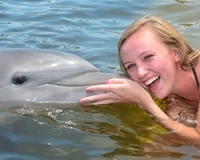 If you've craved the chance to touch a dolphin, this is for you! Discover the excitement of research while having fun with the dolphins! Being a Dolphin Research Center Member includes free annual admission, newsletters, online access to our Members Only website, special event invitations, discounts at our onsite and online Gift Shops, and other benefits depending on membership level. Membership is great way that you or, as a gift, someone special can support DRC by becoming a member of our extended family. DRC's staff and dolphins are currently working on a number of cognitive and behavioral research projects that relate to their overarching goal of mapping the dolphin mind and understanding how dolphins think and learn. Check here to see what's in the research spotlight, publication announcements and details of DRC findings. This information is also featured in a bi-monthly newsletter for members. The DRC Training Institute offers an Occupational Associate’s Degree in Marine Mammal Behavior, Care and Training. 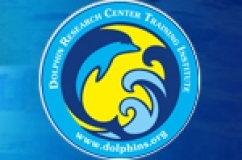 Established in 2012, DRCTI was conceived in response to the limited availability of licensed and accredited professional educational programs that prepare individuals for careers regarding the behavior, care and training of marine mammals. Our DolphinLab programs offer a combination of educational seminars, workshops, demonstrations, in water and hands-on learning activities with our dolphins, sea lions and staff family. 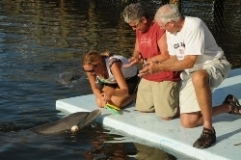 Three DolphinLab programs, DolphinLab Adult, DolphinLab Teen and DolphinLab Group, are available and suited for any learning level. 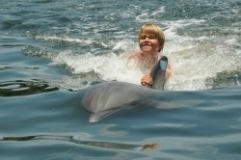 Some DolphinLab programs also offer the unique opportunity for participants to earn college credit while swimming with dolphins. 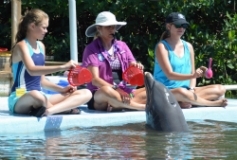 Dolphin Research Center offers many educational opportunities for teachers, including in-classroom curriculum with detailed lesson plans and opportunities for group visits and field trips. Discovering Dolphins, a CD-ROM for grades K through 8, includes curriculum, hand-outs, photographs, sound recordings and more. Explore DRC's resource library for teachers as well as information on outreach and distance learning. 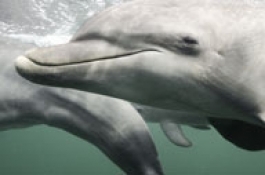 Explore detailed marine mammal information including guides on dolphins, sea lions, manatees, training marine mammals and strandings. 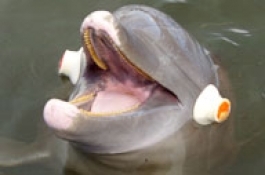 Learn about dolphin acoustics, anatomy, culture, communciation, maternity, natural history and physiology and discover what sea lions and manatees eat, where they live and all about their senses.